With the cold weather, I’ve been craving comfort food. I know it’s not the best thing to be eating when you’re dieting, but I figure I’m too cold to care. 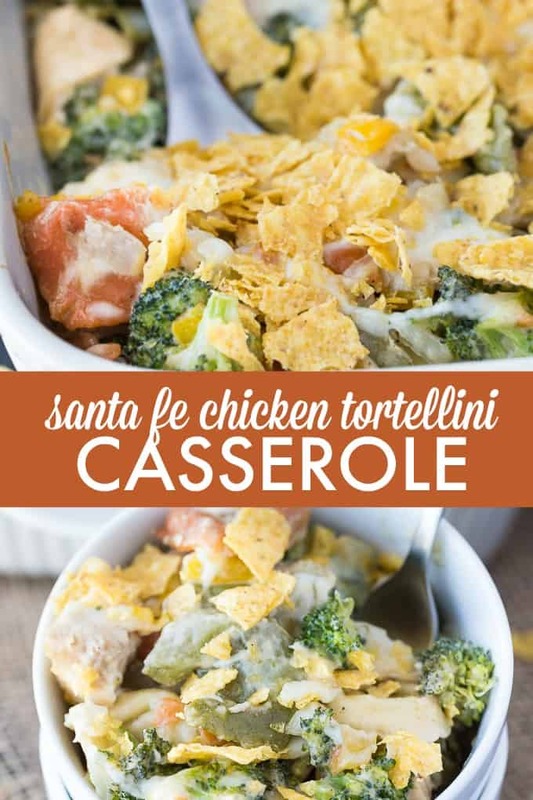 This recipe for Santa Fe Chicken Tortellini Casserole is fairly straightforward to make (though there’s some prep work) and really hits the spot. It’s one that comes from my mom’s Betty Crocker cookbook that has been in our family for a number of years. It’s very versatile and you can change up the veggies and use cream instead of milk for extra richness. 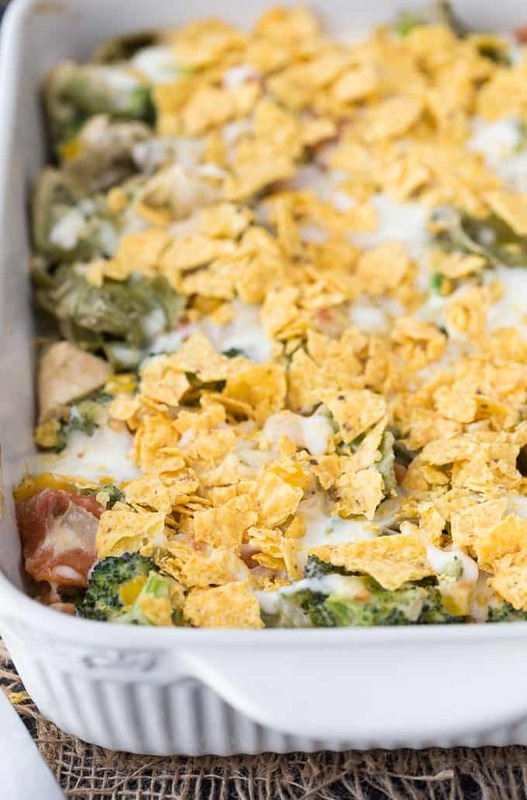 It’s also a great way to use up leftover chicken and tortilla chips at the bottom of the bag. Don’t throw those crumbs away because you can use them for this meal! The cumin gives it a kick of flavour, but this dish is not spicy. There are always requests for second helpings! 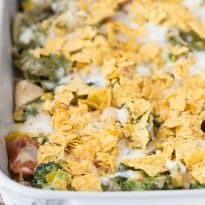 For more casserole dishes, check out this Chicken and Spinach Pasta Cassserole, Healthy Pizza Casserole and Breakfast Casserole. 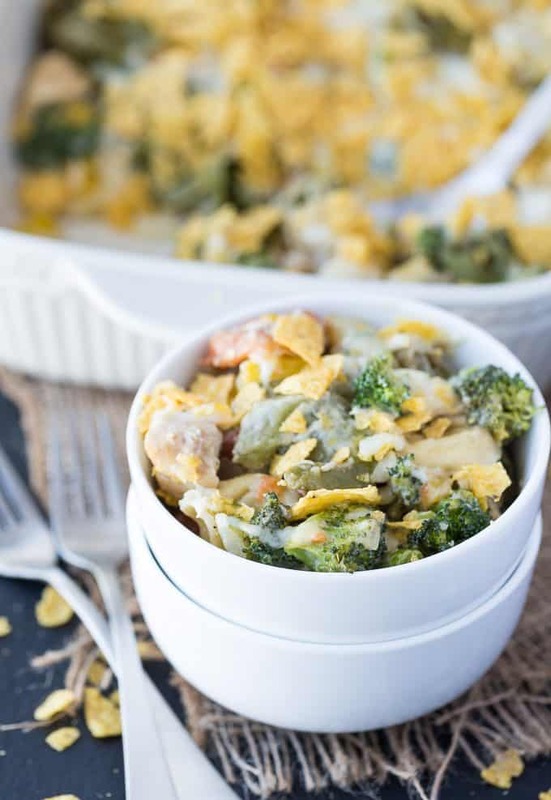 Creamy tortellini pasta with veggies topped with crunchy tortilla chips. Heat 1 tbsp olive oil in a skillet over medium high heat. Sauté onions, broccoli and yellow pepper for about 5 minutes until onions are softened and broccoli is tender-crisp. Remove veggie mixture and set aside. In the same skillet, add 2 tbsp olive oil and flour and mix together over, low heat until smooth. Add in milk (or cream), chicken broth and cumin and stir. Heat to boiling over medium heat, stirring constantly.Remove from heat. Add chicken, veggie mixture, ¾ cup cheese and pasta to the sauce mixture and mix together. Transfer mixture to a 9×13 baking dish that has been sprayed with Cooking spray. Bake uncovered for 25 minutes in a pre-heated 325°F oven. 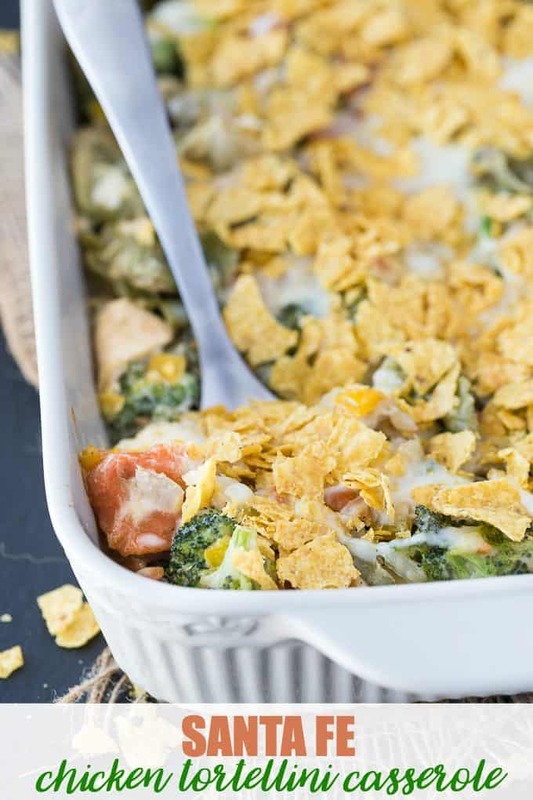 Spread tortilla chips and ¼ cup cheese on top of casserole and return to oven for an additional 5 minutes or until cheese is melted. Let cool 5 minutes and serve hot. I am pinning this one it looks awesome! Thanks so much for sharing your post with us at Full Plate Thursday and come back soon! Thanks for sharing yet another wonderful recipe i can’t wait to serve my family!